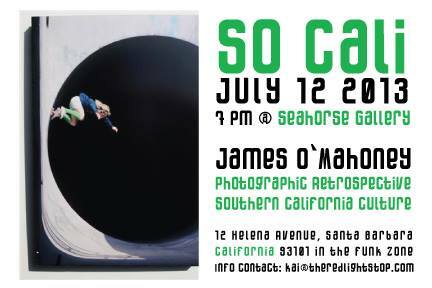 So Cali is a photographic exhibition of Southern California culture beginning from the late 1960’s. The subject matter identifies with aspects of California surf, skate and rock and roll culture. Through the lens of Jim O’Mahoney, the viewer lives vicariously through these images. From race cars in long beach, skateboarding in Santa Monica, and a Rolling Stones show in L.A., “So Cali” adrenaline seeps through the ink, leaving one with the feeling of being “So” California. Jim O’Mahoney is perhaps most well known for his work as a photographer, capturing the essence of Southern California skate culture from the late 1960’s to present. His personal background in skateboarding and surfing lends him the ability to capture faultless action shots. O’Mahoney’s documentary work creates a visual narrative that identifies the “Golden Era” of Southern California. The images of O’Mahoney have been published for a number of magazines and newspapers including Newsweek, Life, Sports Illustrated, Time, Skateboard Magazine, Surfer’s Journal, Juice, Juxtapoz, Los Angeles Times, and The New York Times. He has also been published in several foreign magazines including Match (Paris), Stern (Germany), and Glide (Japan). He has won a number of awards throughout his successful career and has been the Race Management Photographer for the Long Beach Grand Prix since 1975. O’Mahoney is the creator and curator of the Santa Barbara Surf Museum which opened in 1992. Many are familiar with his impressive memorabilia collection. Like his collected artifacts, his photography offers valuable stories of our past and present cultures and sub-cultures. So Cali has been made possible through the vision and collaboration of Jim O’Mahoney and Kai Tepper of the Red Light Stop. For more information on this event and other upcoming projects please contact Kai Tepper at kai@theredlightstop.com. ← Art Zone SB – Friday July 12th.